Flexibility plays an important role in e-learning. Not only when it comes to course preparation or execution, but also with member management. Flexible solutions are needed in many situations, whether it is because restricted user groups are to be enrolled in courses, because some email addresses are not known, or because you want to sell your courses and do not know in advance who will finally choose your e-learning course. In this article, you can read which 2 × 4 methods for membership management Coursepath offers and which purposes they suit best. Within each of these two methods, there are 4 ways respectively, to further define how course enrollment works. When choosing self-registration for example, participation in the course may be restricted or the access authorization may be extended. All ways are described in more detail below. If the email addresses of the future participants of your courses are known, you can easily add them to the course by entering said address. Manually entering large numbers of email addresses can quickly become time-consuming, but alternatively you can upload an Excel or CSV file with all participants. Tip: In a downloaded list of participants, changes can be added quickly and easily. Uploading the updated file also automatically updates this data in Coursepath. The only exception being the change of an email address: this will create a new user. Email addresses can be adjusted in the member’s profile. After entering or uploading the email addresses, an individual invitation will be sent to the participants, the text of which you can customize yourself. All invitations are sent in the design of your academy, offering a high recognition factor. The recipients of the mail then only have to confirm the activation link and can enroll in the course. If you are using single sign-on (SSO) in your organization, e.g. for logging into the company’s intranet or human resources system, Coursepath can be linked to these systems as well. This way, participants who are already registered in one of these systems will automatically be logged into Coursepath. A very easy way to invite employees to the LMS or to individual courses. Participants whose anonymity is to be maintained at all levels can be added without email address or other personal information. The option “anonymous accounts” is available for this purpose. The use of aliases or pseudonyms guarantees anonymity. However, you also have the option of adding users via an Excel or CSV file here, should it be a large number. Once uploaded, Coursepath automatically generates access codes. These can then be forwarded to your subscribers, who can log into the LMS using the codes and a pseudonymized username. A disadvantage of this method is that with the omission of the email address, system messages, such as automatic reminders, cannot be sent. Another possibility to invite participants to courses without email addresses is the voucher system. These coupon codes for course enrollment can be generated easily. If needed, you can add labels and expiration dates to the voucher codes, this way generating any number of codes. 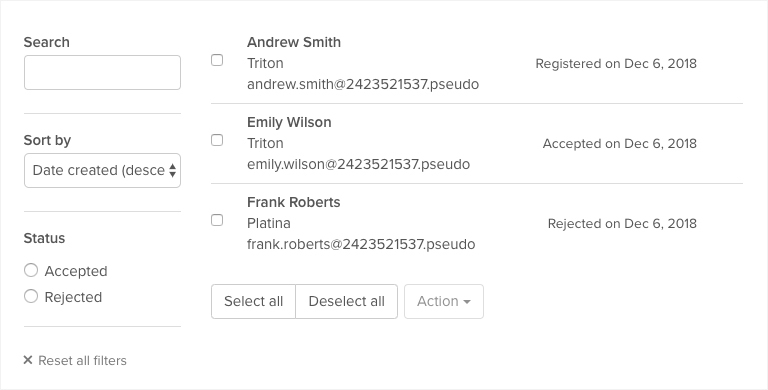 The voucher codes allow recipients to independently create fully adequate user accounts, to which they can also add their email addresses. 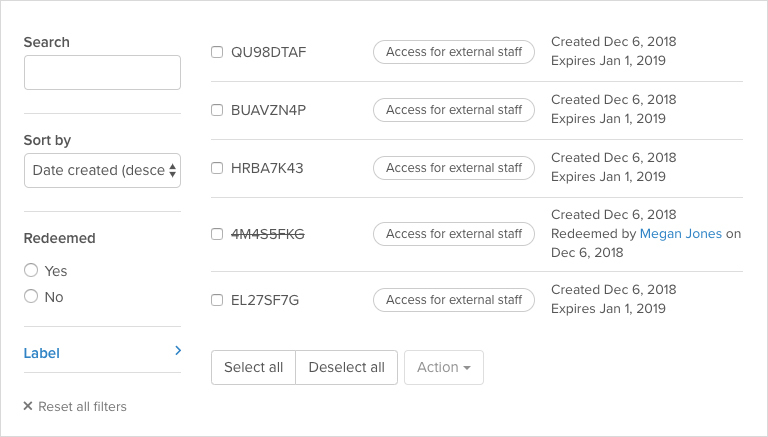 Via the voucher menu, you can keep track of which codes have already been redeemed and which are still open. With voucher codes, recipients create their own user account. This option is only available at course level, voucher codes cannot be used for enrollment in the parent academy. When enrolling in the course, however, a course participant automatically becomes an academy member and can enroll in other courses – provided they are open for self-enrollment. Voucher codes are ideal if you want to invite employees or partners of a customer whose email addresses are unknown to you. Simply generate e.g. 100 voucher codes for partner A and 250 voucher codes for partner B, letting the partner distribute the vouchers internally. Course enrollment options. Manual invitation of participants is available for each option. Within the course options, you can open courses for existing academy members. Members can enroll themselves in additional courses within the academy without needing confirmation. As academy manager, you will be notified of enrollments by email. You have a little more control over registrations with the option ” on request by using the ‘Enroll’ button”. If members are interested, they can request enrollment by clicking the button. However, course contents are only visible once a manager or assistant of the course confirms the request and thus enrolls the participant. Please note that you also have the option to deny access if necessary. Enrollment requests can be accepted or denied. In contrast to self-registration for academy members only, with this option, the course starting page can be accessed by anyone on the internet and is not limited to academy members. If you make your course available for public, it is basically open to everyone via the internet, i. e. also for people who are not yet members of the academy. Open courses are also known as MOOC. If you advertise your course, e.g. via banners or iframes on your website, you can reach more potential participants. Anyone interested can then simply enroll for the course and start learning directly. When registering for the first time, they create a user account with their email address. In principle, similar to open courses, anyone can enroll for courses offered via e-commerce. The difference here, however, is that the course content is only available once a predetermined course fee has been paid. This enrollment option is especially useful if you want to sell your e-learning courses to clients. Read more about Coursepath’s flexible payment methods in this article. 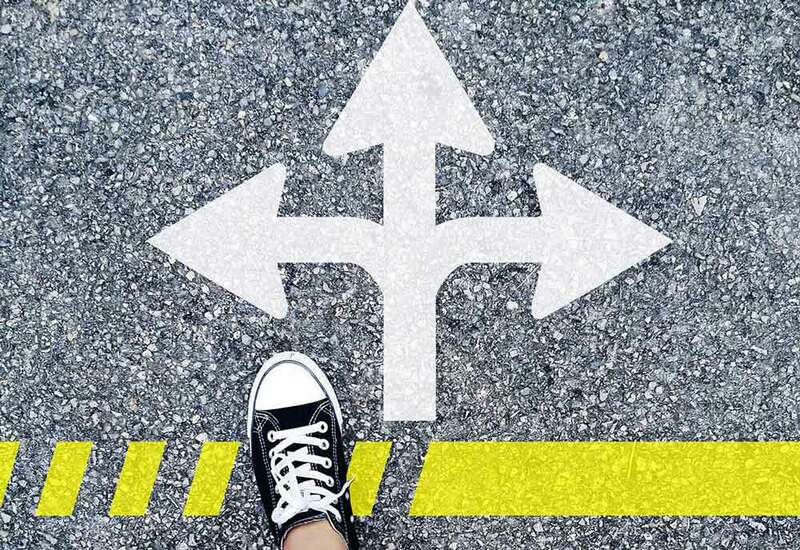 There are many ways to enroll for courses on Coursepath, and no matter which area of application you are aiming for, a suitable method can be found. You do not have to commit to one single method per course: Combine different methods or return to the settings at a later time to change them. Participants can either be invited to individual courses or to the entire academy. When logging in for the first time, the new users must choose a secure password themselves and can then access the content they have permissions to see. Want to learn more about the options Coursepath offers for your business? A short webinar will give you helpful insights into the e-learning platform and how to set up your own online training.